Okay, I'll make this short -- I can't compete with the 80 bazillion other tech blogs that are spilling plenty of digital ink right now about all the new Amazon Kindle tablets that Jeff Bezos announced this morning. 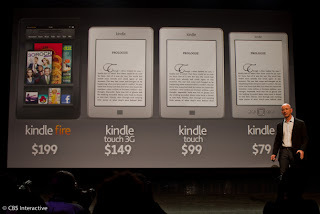 First, you'll notice that of the four devices Amazon rolled out today, only one, the $149 Kindle Touch 3G, offers cellular access to Amazon's Kindle store and your Kindle library. The high-end $199 Kindle Fire, a tablet that promises to allow bandwidth-intensive video streaming, sticks to WiFi -- which is hardly surprising. I doubt any cellular carrier would give Amazon a contract to carry its customers' Kindle Fire traffic without demanding a huge premium. There's an enormous difference between downloading Jane Austen's Pride and Prejudice and Keira Knightley's Pride and Prejudice. Still, I'm a little disappointed Amazon hasn't made a deal with a carrier to offer pay-as-you-go 3G data service for the Kindle Fire the way Apple does with the iPad. Second, the Kindle Fire browser, Amazon Silk, is both an acknowledgment that color tablets are data hogs and a brilliant move to make the Fire both faster and more Amazon-centric. Essentially Silk has been designed to do all its browsing via Amazon's EC2 servers, which act as a kind of enormous browser cache in the sky. There's more to it than that -- if you watch Amazon's video about Silk there's some predictive hocus-pocus that seems to claim the browser will adjust itself to your browsing habits and, anticipating where you'll go next, pull those pages onto the EC2 servers, ready to deliver before you even ask for them. Whether or not this strategy works consistently (and if it does Kindle Fire owners will definitely be expecting 99.999% uptime from those EC2 servers ... even though Amazon promises only "99.95% availability for each Amazon EC2 Region" in its service level agreement for third-party subscribers), it locks Amazon's customers just as firmly into Amazon's content universe as the older Kindles' proprietary ebook format did for the company's legions of readers. Come to think of it, Jeff Bezos may be thinking this innovative streaming strategy may be just as effective at keeping customers hanging around Amazon as Mark Zuckerberg's social media strategy is at keeping his members hanging around Facebook. Does Android GPS Need Cell Service to Work? Google Maps appears to use cell towers to locate a user indoors when the LG Optimus V's GPS can't find a satellite signal. But what if you're out of doors and a satellite signal's all you've got? To follow up on my last post, Top 5 Virgin Mobile LG Optimus V Annoyances, I’ve uncovered interesting intelligence contradicting my Annoyance #4, GPS System Needs Cell Service to Function. The other is the GPS satellite location which is what you need for navigation. 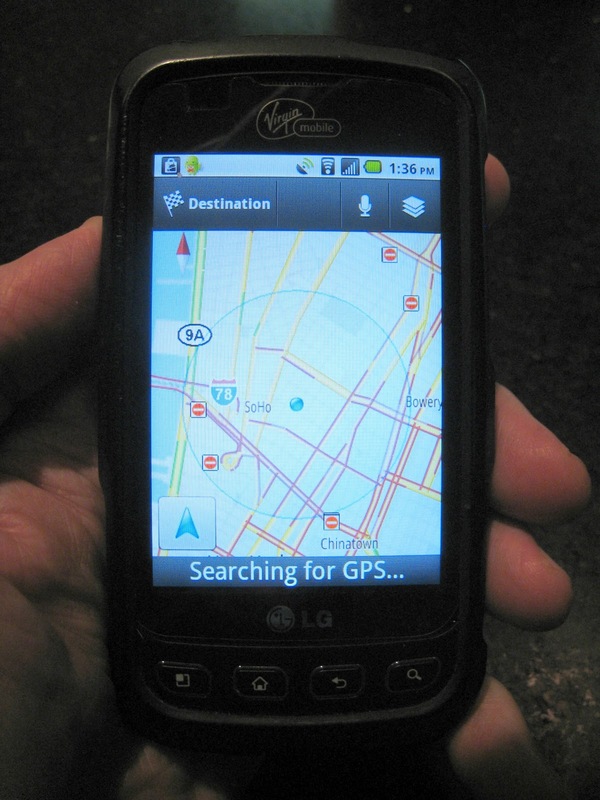 Android phones, like many smartphones, also use Assisted GPS (aGPS). This allows them to compute satellite position using the network and get the location faster. So it would seem that’s why any smartphone, android or not, uses aGPS instead of plain GPS: to pinpoint your location in seconds instead of minutes. Which means Virgin Mobile’s LG Optimus V actually doesn’t need cell service for its GPS system to work. However, it does need an app, like BackCountry Navigator, that functions happily when cell signals are nowhere to be found. Unfortunately, that also means an app that doesn’t use android's default Google Maps the way Google Navigation does. Google Maps clearly relies on cell service to locate users quickly and, when none is available, fails to resolve your position on your phone’s display ... as I discovered when I took my LG Optimus V to the wilds of western Maryland. I found an alternative, Sygic, whose Android Market product page boasts that its maps "are stored on the phone for offline use." I'd hoped that claim meant it would work without cell service, but, alas, I couldn't get Sygic to run on my Optimus V. And it may not have mattered, because before you can use Sygic you've got to download its maps -- and that turns out to be time-consuming. For instance, if, like me, you're primarily interested in traveling in North America Sygic asks you to download maps state by state. I limited my selection to Connecticut, Massachusetts, New Jersey, and New York, but together they added up to 749 MB and took me more than 10 minutes to get onto the phone via home WiFi. And, of course, Sygic's à la carte map requirements mean you've got to remember to download additional maps before you can drive through states Sygic doesn't already know about. Pretty cumbersome. Has anyone landed on a solution to this irksome problem? Is there another app that does what Sygic promises without the onerous map download requirements? The easiest answer would be for Google to include an option allowing Google Maps to locate users using only their android phone's GPS chip. It occurs to me, though, that Google Maps also needs cell service to stream Google Maps details (some of which may be commercial, such as restaurant, store, or hotel locations) to your phone on the fly, so it can sidestep Sygic's heavy-duty offline map storage requirements. If that's the case there may never be a solution for Virgin Mobile android phone users -- at least as long as we're using the LG Optimus V's less than perfect radio antenna on Sprint's less than ubiquitous network. Get a smartphone without the hassle of a contract with LG's Optimus V from Virgin Mobile.